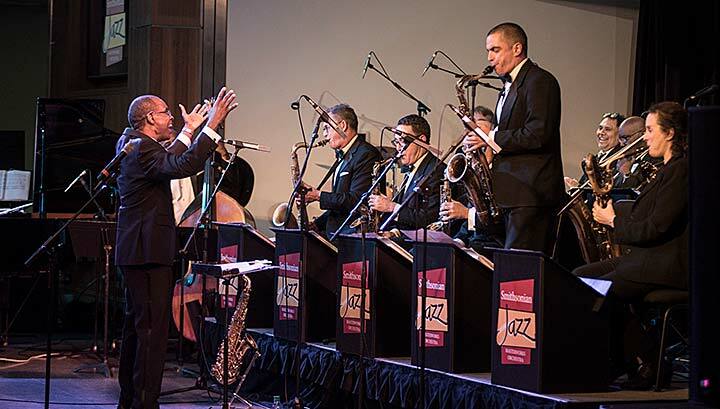 As part of this tour, the orchestra, under the direction of saxophonist Charlie Young, visited London on April 6th, appearing at the Milton Court Music Centre, located in London’s Guildhall School of Music. 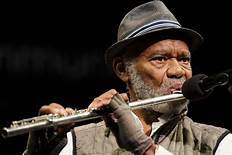 This is of particular interest to Flute Journal readers as their guest soloist on this occasion was NEA* Jazz Master, and flutist extraordinaire Hubert Laws. 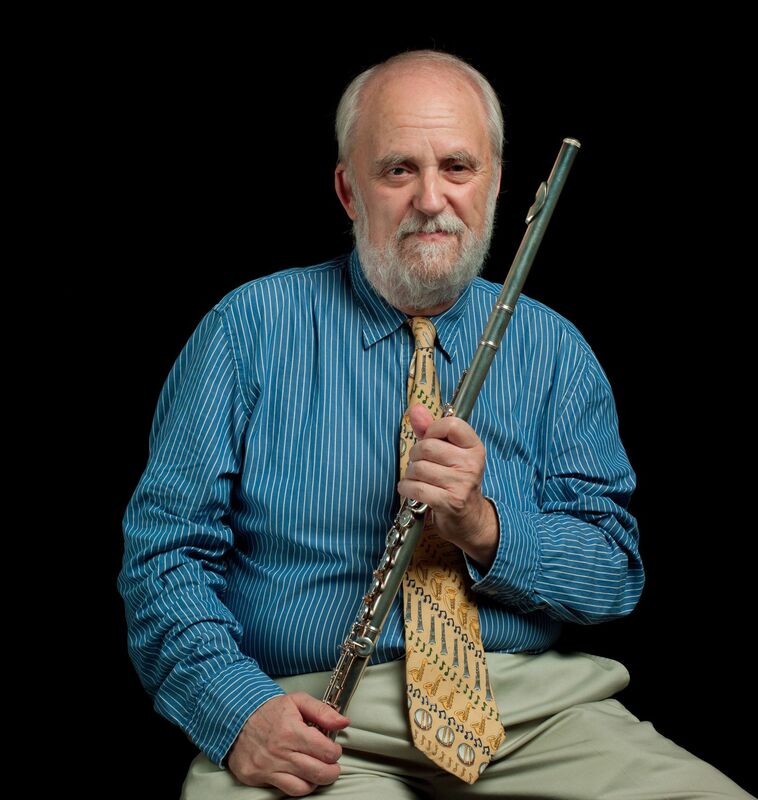 Laws is a major figure for flutists, with the highest level of credentials in both jazz and classical performance. Delighted to find Hubert both looking and sounding in top form, I was there with our London correspondent Maddy Shaw. 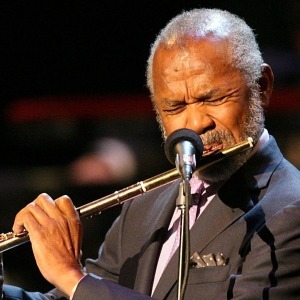 Pleasing as the SJMO was, the evening became most fulfilling to these writers when the evening’s guest artist Hubert Laws walked onto the stage, carrying flute and piccolo. “Hubert Laws cuts an elegant figure on the stage of Milton Court this Saturday evening. He perches on the edge of a bar stool, leaning in to us, the audience, conspiratorially. The very picture of sartorial grace in his silver-grey suit, tie and trilby, blending perfectly with a stylish close-trimmed silver-grey beard. An immaculate black shirt, black half-gloves. A flash of red from the claret handkerchief in his top pocket. The silver flute is placed with respect on the small side table beside him. 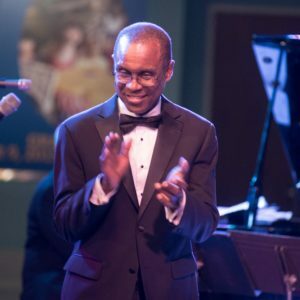 The rank and file of the Smithsonian Jazz Masterworks Orchestra – suited and booted – line up behind him. “This is the start of a year long world tour by the SJMO featuring different leading artists, celebrating jazz as it has developed across the globe. 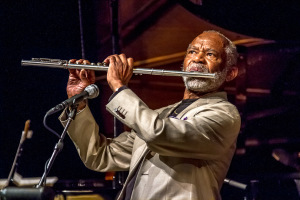 Hubert Laws needs no introduction – the internationally acclaimed flutist has proven himself in classical, jazz, pop and RNB music and in 2011 was awarded the National Endowment for the Arts * Jazz Masters Award. “’The last time I was in London, my hair was black,’ he quips. ‘So was ours!’ comes the heckle from the audience. A low laugh rolls across the auditorium. The atmosphere is heavy with anticipation. Hubert’s husky voice brings the warm cherry wood panels of Milton Court in a little closer, a little more intimate. Already this evening, the audience have listened to a first set by the orchestra – tidy arrangements of standards befitting of the Smithsonian’s objective to preserve and present great works from the jazz canon, fronted by the charismatic director Charlie Young. But the Man is on stage now. There is the collective sense from both audience and orchestra that this is the moment we are here for. We sit forward on our seats just a little. “’I’m here to speak spontaneously,’ he says, ‘I’m making friends.’ And when he opens with Seven Steps to Heaven (Victor Feldman/Miles Davis), the extraordinary voice of his piccolo sounds out warm and assured . . . so familiar. The voice of an old friend, singing clearly over the textures of the big band behind him. He stays on piccolo for the second tune, a terrific arrangement of his 1970s tune Undecided. 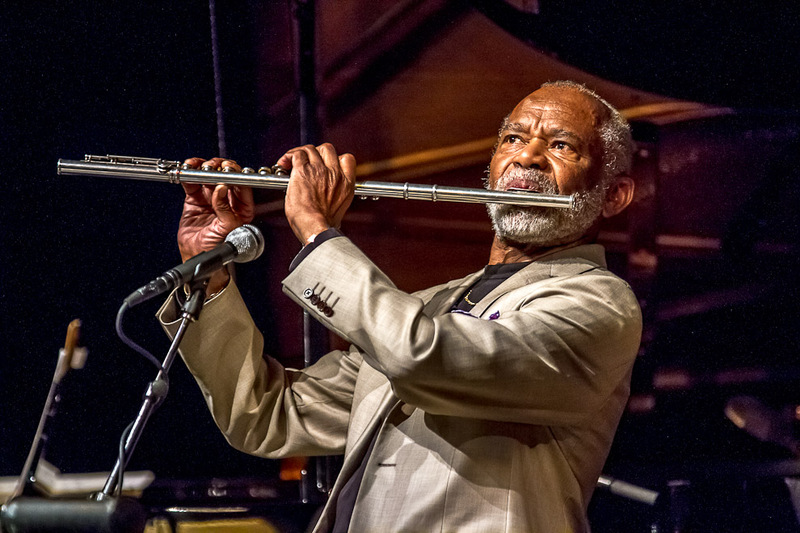 Laws somehow makes this tiniest (and trickiest) of flutes into a mighty force for funk. “The clue as to the primacy of the piccolo comes in the next chat, given that the pic soars so distinctly above the orchestra. ‘I don’t play much with a big band,’ he says. ‘Playing flute with a big band is like a fly taking a trip on a 747.’ More laughter rolls across the audience. There are plenty of flute players in the audience who can relate. “For the record, there is no 747 here. The tunes have been carefully curated, with the dynamics and textures of the orchestra bespoke-tailored to showcase Laws and his flutes. It is worth a nod to the sound engineer here too. 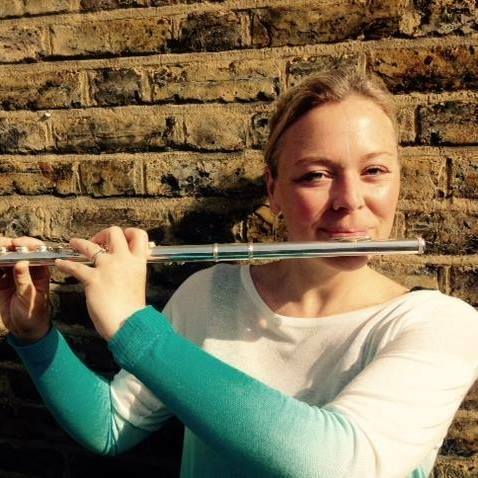 It is a glorious flute-led performance – a fine setting for Laws’ jewelled solos. “In Mean Lene Suite (sic), Laws lays bare a tempestuous marriage – different tempos, different feels take us through the marital ups and downs. 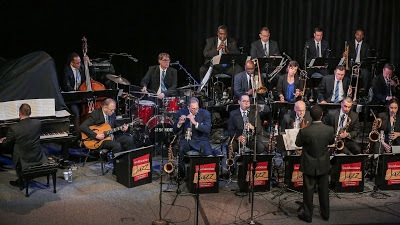 One particularly stormy part of the relationship is captured in the “perpetual persistence” of the repeated riffs of the saxophone section, while the trumpets call desperately for release at Laws’ direction. “To finish – Malaguena – a superb driving tune in 3 with an Andalucian flamenco feel from Laws’ 1993 album My Time Has Come – enriched with Laws’ harmonics and flutter tonguing. It is fitting that the finale is supported by 4 other flutes in the orchestra.